Inside the RF-container there is a second lining, with a great RF-shielded door. This is what is known as a Faraday Shield. This inner lining (when closed) will prevent spurious radio signals from escaping. These could then be detected by the antennas themselves, thus thwarting the experiment being carried out by the completed instrument. 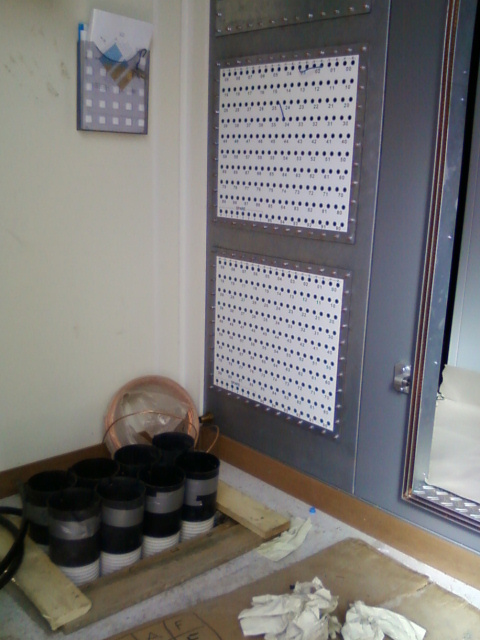 However, the signals from the antennas need to get inside, of course, so to do this a carefully shielded and grounded 'patch panel' is used. The photograph shows the patch panels in the KAIRA RF-container. They are the white panels on the wall. The top one is for the LBA and the lower one is for the HBA. Each panel has 200 holes. These are for the maximum of 192 signal cables from each array, plus 8 spares. The pipes coming out of the floor are the ducts to the outside. Although empty at the moment, these will be filled as the project is wired-up. The first ducts to be used will be the two closest to the patch panels.